Exceptions are used in Time and attendance to indicate an error on the information that the system requires for calculation (like a missing swipe or a missing Day), or to alert that the data that was collected did not match the expected value (e.g. early or late exit). Exception can be raised automatically, or be manipulated by the work rules. In this lesson we will learn how to initiate the exception report , this report is usually created as a part of the ‘End Period’ proceeded . 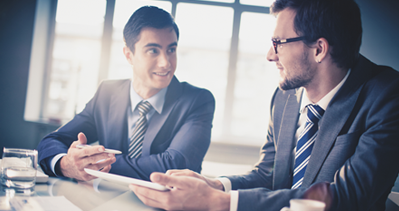 The Exceptions Report includes all exceptional transactions for employees per a predefined period. Exceptions are unique and are determined in the employee work rule. The Time Card Report presents daily data and a monthly total per employee and can be submitted to employees for review and approval. 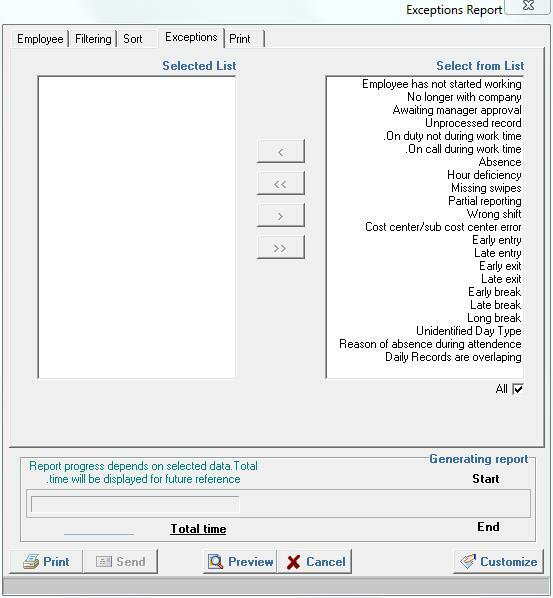 Select Reports > Time & Attendance > Exceptions. Select the type of exceptions that you want to show. A task swipe is missing Includes the missing task swipes. Missing Swipe for Task When an employee forgets to report a certain task during entry or exit, or when an employee reports a new task without ending the previous task. Exit time must be earlier than task end time The task end time before reporting Exit. No longer with company The employee is no longer working at the company. Awaiting manager’s approval The record has not yet received manager’s approval. Unprocessed record Declares that a record has not been processes. On duty not during work time The employee is reported as on duty not at the specified work time. On call during work time The employee is reported as on call and also specified as on work time. Non-working Day The employee is paid for actual work hours on a day which is not defined as a standard work day: holiday, weekend, etc. – Deleted? Absence When an employee fails to clock the card on a certain work day. Hours Deficiency Hours quota for a certain day was not fulfilled according to the definitions of the Work Rule. Missing Swipe The employee was at work but did not clock the card. Partial Reporting The employee was at work, but reported partially for a task (entry only without exit). Core time infringement Indicates an inconsistency in the core time. Early Entry The employee started the work day earlier than indicated in the Work Rule. Long Break Total break time exceeds the time indicated in the Work Rule.